Select the desired location for your extension. 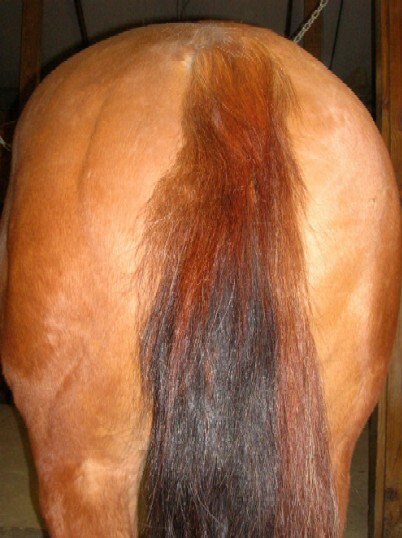 This is generally about 1/3 of the way down from the top of your horse’s tail but will vary slightly depending on the length of your extension and the length of your horse’s tail bone. 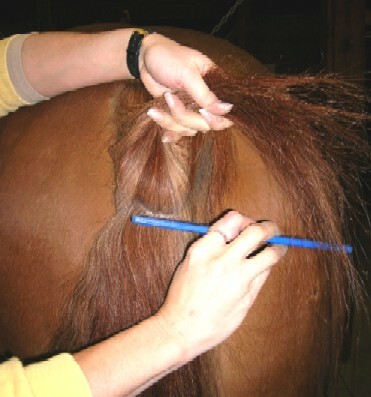 Using a comb, part straight across the horse’s tail. Pull the upper hairs up and out of the way and secure with bands or clips. Next, using a comb part across the top of the extension exposing the first 2 grommets. Pull the hairs above the grommet holes up and out of the way until you have finished with this step. Note: some hide extensions may only have 1 grommet hole at the top. In these cases simply skip this step. 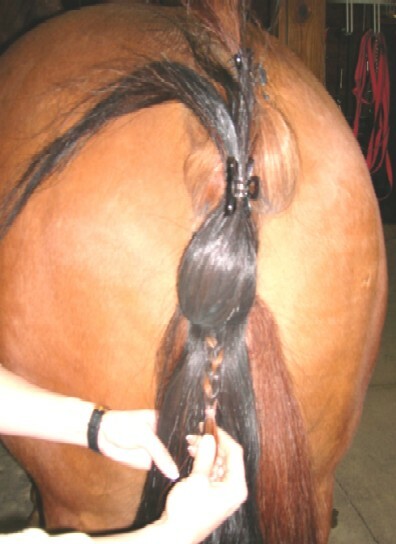 Using a latch hook, pull sections of the horse’s tail through the right and left grommet holes. Next pick up a lock of hair from the extension in the area between the two grommets. You will now have 3 sections of hair in your hand. Tightly braid these sections together. 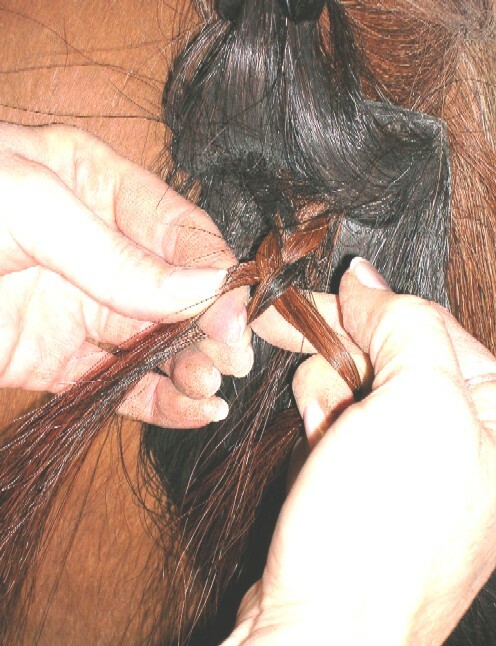 You only need to braid down a few inches and secure with a rubber band. Next move down the extension. Again part the hairs of the extension exposing the grommet. Pull the hairs above the grommet hole up and out of the way until you have finished this step. You will now see only 1 grommet in the center of the extension. 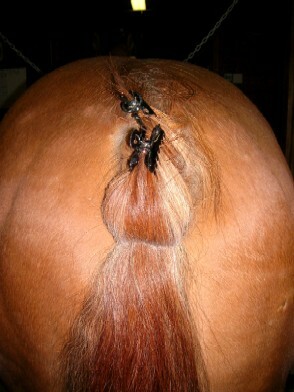 Using a latch hook pull a section of the horse’s tail though the hole of the grommet. Next, pick up a lock of extension hair from the area to the right of the grommet hole and one from the area to the left of the grommet hole. Once again you have 3 sections of hair that you will braid tightly together and secure with a rubber band. Continue this process down the length of the extension. When choosing your location for your extension make sure you have enough “upper hairs” to cover the top of your extension. 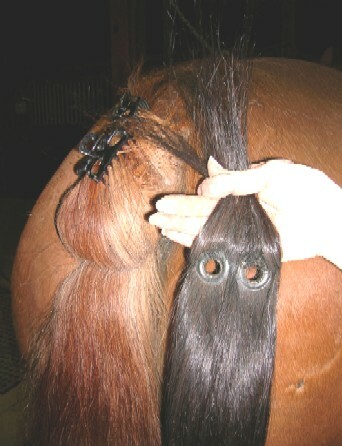 Make sure you pull enough of your horse’s hair through each grommet hole. i.e. 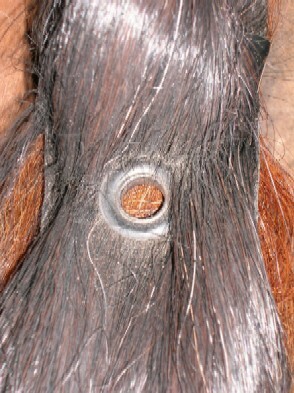 The larger the grommet, the larger the section of your horse’s hair that you should pull through. Blow dry and fluff your extension to give it a full look.<?XML:NAMESPACE PREFIX = O /> To remove knots use your fingers or gently brush, DON’T PULL, your tail extension.